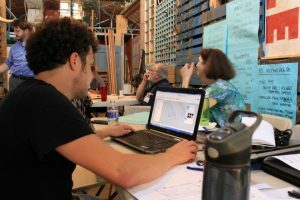 First of all you may ask: What is a “Design Charrette“? As you can see, the origins of the term ‘charrette’ go back into ancient history and yet the viability of charrettes used in today’s projects cannot be denied. It is a fact that architectural and engineering firms have long utilized Design Charrettes to help describe and define the attributes of a project by forming “Integrated Design Teams”. These teams typically consist of a lead architect or engineer, the project owner and others authorized to formulate strategies and guide decisions toward a better final product. In other words, design charrettes have been utilized successfully for many decades to help create and construct some of the most beautiful and sustainable/green projects in the world including buildings, cities, bridges, homes, lodges, etc. The list could go on forever because the use of charrettes can benefit any project in achieving a better outcome, no matter how big or small. In years past the use of Design Charrettes was considered to be a luxury or something that only the larger firms or projects would utilize. However, newer construction and energy codes are making projects more complicated to construct to meet code, even the smaller ones such as home renovation or room additions. If you don’t meet code you will probably have to redo the problematic parts. By undertaking Design Charrettes in the conception and design/drawing stage of your project you can enlist the help of others, including certified/licensed professionals, who understand the codes and how to build to meet them. Does your project conform with the ADA – American Disabilities Act – in that you have allowed wheelchair access and made other similar accommodations? Are you wanting to make your project resilient, meaning that it is built to help withstand the potential environmental threats for your particular geographic location, be it wild fires, floods, drought, earthquake or other possible man-made or natural disasters? Is the cost and/or availability of water, energy or other resources becoming an issue? If so, you may want to incorporate other aspects into your design, such as rainwater catchment, zero-energy construction and/or renewable energy systems. Are you wanting to build to meet a particular sustainable/green program such as the US Green Building Council’s LEED programs, the Green Globes program, the National Green Building Standard or even other local, regional or state sponsored programs? Is your project slated to achieve a certain energy efficiency status, such as an ENERGY STAR building, a DOE Energy Challenge project or such? Are you wanting to build a precedent-setting building or project that achieves Passivhaus (Passive House) or Living Building Challenge status? As you can see there can be many aspects involved in the project that you are planning to build or restore, some being optional while others are absolutely required. There is an old saying or adage from the construction trades that goes; “Measure Twice, Cut Once“, meaning that it is much better to take the time to plan and measure than to have to toss good materials due to poor planning/measuring. It is the goal of DesignCharrette.com to make charrettes universally available through the use of innovative electronic platforms that can reach around the world*. Is your architect in California while your master contractor resides in Florida and you, the project owner, live in Denver. You could meet in-person during the design and construction phases of your project but the time lost and travel cost will severely impact your budget. Meeting online can reduce or even eliminate travel costs and has the added benefit of storing files of drawings and documents while recording your meeting(s) for future review. *DesignCharrette.com currently uses English as the primary language and may not have the filters or translation capabilities needed to accommodate meeting and projects utilizing other languages at this time.